Yes! It's time for another round of our highly acclaimed photography workshops! I am so excited every single time I get to do these workshops! I've met so many great people who are wanting to improve their photography skills for any number of reasons from wanting to become a professional, pros looking to up their game, parents who just want to get great photos of their kids playing sports, and so on and so on. 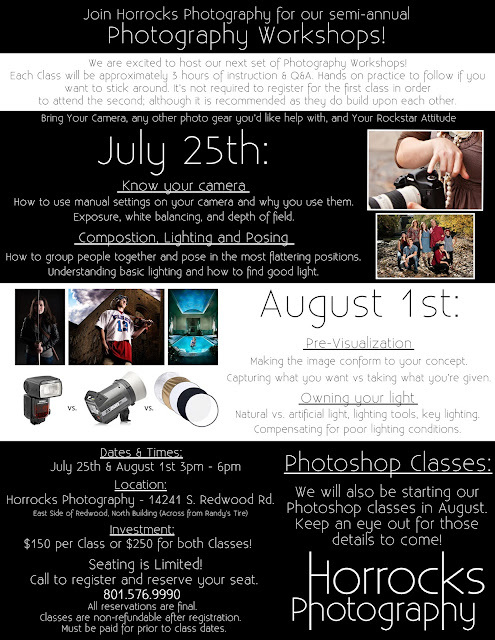 There are infinite reasons to want to be better at photography, and I am proud to say these workshops do exactly that! We are shaking it up a little from our regular routine this time (I'm secretly hoping this becomes the norm because it will allow us to do them more often - woot woot!). We will be doing them on successive Saturday afternoon/evenings from 3:00pm-6:00pm. With that extra scheduled time we will be able to cover everything we had been covering in 5 weeks of classes in just 2! Following each class I have opened up my schedule to allow for as much hands on practice as you all want to do - pretty sweet right?! The small class size. I try to never have more than 8 people per class. If you've ever done workshops before, most of them are full of 50-100 people and usually lead to you not getting any personal attention. With the small numbers you are free to be as inquisitive as you want to be! It really does have a family feel to it, and everyone always says how comfortable they have felt during them. The hands on time. You're here, I'm here, my assistant is here...there is no reason we shouldn't take the time to practice and troubleshoot together. Like I mentioned above, on these days I'm all yours. Use that to your advantage! They are never the same class. It's funny, I've been doing these semi-annually for 5 years now, and, although the general content covered is typically the same, with all the unique interests and your questions/needs we always cover so many interesting things. You could seriously do these every time we have them and come away feeling like it was beneficial. They are built around you. Although there will be things we want to cover because they will make you a better all around photographer, I want to serve your needs. While these are initially built around portrait and commercial photography - since that is my specialty - I cover whatever aspects best serve the class members. So if you're into landscapes (for example) I'll be sure to cover that side of things as well as the portrait side or whatever else happens to best serve everyone there. There are more benefits, like our private Facebook group for all workshop alumni, but I think those are probably my favorites. I can't wait to see you there - be sure to book your seat ASAP before the classes are full! Oh, I almost forgot to mention, keep your eyes peeled for another post about our upcoming Photoshop workshops! They will be starting soon as well! Copyright Horrocks Photography 2014. Awesome Inc. theme. Theme images by moorsky. Powered by Blogger.